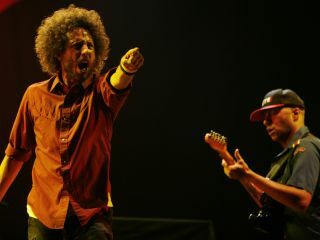 Rage Against the Machine lead singer Zack de la Rocha has enlisted dozens of musicians, among them Joe Satriani, Cypress Hill, Kanye West, Conor Oberst, along with various activists to join The Sound Strike, an open call to boycott the state of Arizona over its recently passed immigration law. Called SB1070, the law passed by the Arizona state legislature requires local authorities to determine a person's immigration status if he or she is suspected of being undocumented. "Fans of our music, our stories, our films and our words can be pulled over and harassed every day because they are brown or black, or for the way they speak, or for the music they listen to," de la Rocha wrote in an open letter announcing the Sound Strike campaign. "People who are poor like some of us used to be could be forced to live in a constant state of fear while just doing what they can to find work and survive. This law opens the door for them to be shaked down, or even worse, detained and deported while just trying to travel home from school, from home to work, or when they just roll out with their friends." The Sound Strike appeals to other artists to sign on to the boycott of Arizona, and asks fans to sign an online petition calling for the law's repeal. Among the other artists who have already joined the cause are Serj Tankian, Michael Moore, Rise Against, Ozomatli, Massive Attack, One Day As A Lion, Street Sweeper Social Club, Sonic Youth and Tenacious D.
Speaking to Billboard, Joe Satriani said he was first approached to join the boycott by Tom Morello and subsequently contacted de la Rocha. "It's a tough issue," he said, "because I understand, if you live down there in one of those border towns, you feel like you're under siege. But I think more brain power has to go into the solution to this. SB1070 just doesn't have enough in it to make it a good law. In the last 15 years the erosion of rights of American citizens has put us close to a police state...You can't just jump on something like this and stop thinking about better ways to solve problems." According to Satriani, the federal government has to help in taking charge in the situation. "We have a federal immigration department; they should be the ones dealing with this." The guitarist also added that he felt "terrible about the idea of boycotting Arizona. I have friends there. I have a lot of fans there." Among the acts that have already canceled shows in Arizona are Pitbull and Cypress Hill. Latin music stars Jenni Rivera and Wisin & Yandel are said to be bypassing the state on their AEG Live-promoted summer tours. "My personal belief is that the law, which is misguided and poorly written, is unconstitutional and will not survive the multiple legal challenges being filed," AEG Live president/CEO Randy Phillips told Billboard. "Until that time, however, the economic impact on the state from losing even a couple of tours might be enough for the legislature and the governor to realize that there is still a political concept called the tyranny of the majority which is just as dangerous to our democracy as illegal immigration, maybe more so."